Dr Seuss’s books are always a big hit at my home. My daughter just loves reading his books along with me. All his books have a poetic appeal and senseless rhyming. March is his birthday month and its celebrated by kids all over the world with reading sessions and craft activities related to Seuss’s book. From Wikepedia – Dr Theodor Seuss Geisel ( March 2, 1904 – September 24, 1991) was an American writer, poet, and cartoonist. He was most widely known for his children’s books written and illustrated as Dr. Seuss. His each and every book is my favorite, but following 5 are close to my heart and are must for each kid’s library. 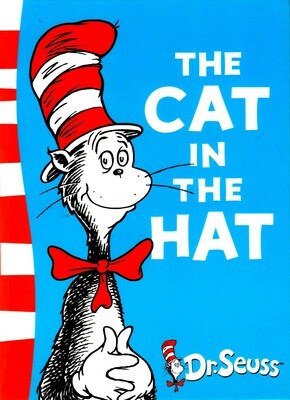 The CAT in the Hat: There are two siblings, Sally and his brother who are sitting idle on a rainy day. Being a rainy day, both are left with nothing to do. But suddenly something went bump and that bump made them jump. And then enters our hero of the story- The Cat in the hat and the siblings set into an adventure in the house with the fish, thing one and thing two. They have made riot at home in mom’s absence. My daughter loves to pretend that the cat is coming home and she is making mess with her imaginary things. There is a movie adapted on this book. 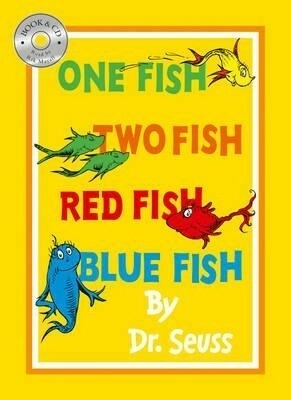 One fish Two fish, Red fish Blue fish: This one has magical rhyming. I love to sing this with my daughter. There is a boy and girl in the book who is enjoying and having fun in this pure magical rhyming book. My daughter loves to create her own rhyming words with this book. This is a good book to teach the concept of rhyming words to kids. Dr Seuss ABC: Big Z little z..What begins with Z. Zizzer-zazzer-zuzz. Only Dr seuss can think of such words with each alphabet, which teaches the sound of the words not only with its beginning, but also till the end. There is no main character and there is no specific setting. It’s a pure senseless book which will give you a lot of giggles with your little ones. We must have read this 100 times and each time we recite ‘jerry Jordan jelly jar’ and four fluffy feathers on a fifer-feffer-feff gives us the same amount of pleasure. Green Egg and Ham: This book is about SAM and his friend who is always grumpy. SAM is trying hard for his friend to try Green egg and ham, however his grumpy friend is not ready to try the new thing. This is an excellent book to teach fussy kids about trying new things. My Many Coloured Days: This is a Dr Seuss debut book and it’s perfect to teach kids about emotions in association with colors. It’s specifically difficult for kids to express their emotions. This book helps them to understand their own and other’s feeling as well. The best thing about Dr Seuss’ book is that it appeals to the adults in the same way as it appeals to kids. I love to read it myself. Yes at this age too, I enjoy a lot reading all his rhyming book. That’s the magic Dr Seuss has created in me.